Before playing this game, discuss the principles of echolocation with the class. The aim of the game is for the bat to catch the moth using only his/her voice and for the moth to evade capture as long as possible. For the first round choose one child to be a bat and another to be a moth. Ask all the remaining children to join hands and form as large a circle as possible, the bigger the circle the better. Blindfold both the bat and the moth, make sure they can’t peek, and lead them into the circle. Turn them around several times so they don’t know where they are facing. 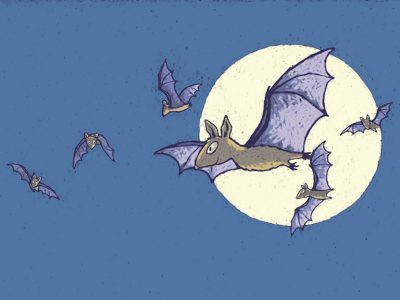 To mimic echolocation the bat repeatedly shouts ‘BAT!’ and every time the bat shouts ‘BAT!’ the moth must respond by saying ‘MOTH!’. The circle of children must make sure that neither leaves the circle. You may have to remind the moth to respond to the bat’s calls. After the first round, increase the number of moths in the circle to two or three and see how the bat responds. Then repeat again with different children but ask a number of children who are standing in the circle to be trees. So they shout ‘TREE!’ in response to each ‘BAT!’. 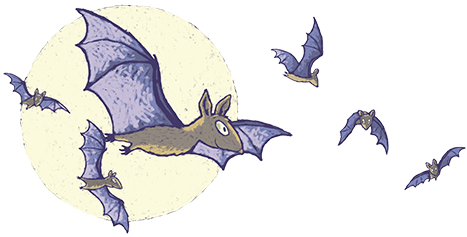 In this way the children can see that a bat must distinguish between echoes from many things when flying around looking for insects and avoiding obstacles. This game explains the principle of echolocation: bats continuously make sounds and listen for echoes to locate their prey and to avoid bumping into obstacles.